Thanks to your software, I don't have any fear of losing my files anymore. Real time sync is quite useful. Thank you! The real-time sync is the real deal .... I'm constantly changing files that get synced to a webserver... With BeyondSync, by the time I switch to my browser, the file has already been copied. Intuitive side by side folder comparison lets you preview all actions before actual sync. You can see what exactly will happen before the files can be synchronized. Beyond Sync has built-in scheduler to let you schedule sync at a specified time. It can run as a Windows Service to keep your files in sync 7*24. It works in background, no user interaction is required. You can receive email notification when sync completes. All these great features guarantee that your files will be synchronized effectively. That's why thousands of users rely on Beyond Sync to synchronize their important files. That's also the reason that CNET's editor gave Beyond Sync the highest five stars rating! "Fevosoft's Beyond Sync is just the sort of handy little tool we love to have around. It's a simple but capable utility that can synchronize and back up files locally, on network drives, or on just about any sort of external device, in real time..."
So, why not take the advice of the editor of the largest software distribution network in the world and give Beyond Sync a try? to ease your life right now, or download a 30 day trial version for free. Your files will be synchronized immediately when they are created, updated or deleted. It works in background, no user interaction is required. Beyond Sync can run as a Windows Service to keep you files in sync 7*24 hours. No matter you logged in or not. You can synchronize folders with other computers easily. Synchronizes multiple files at the same time. You'll get the best performance. 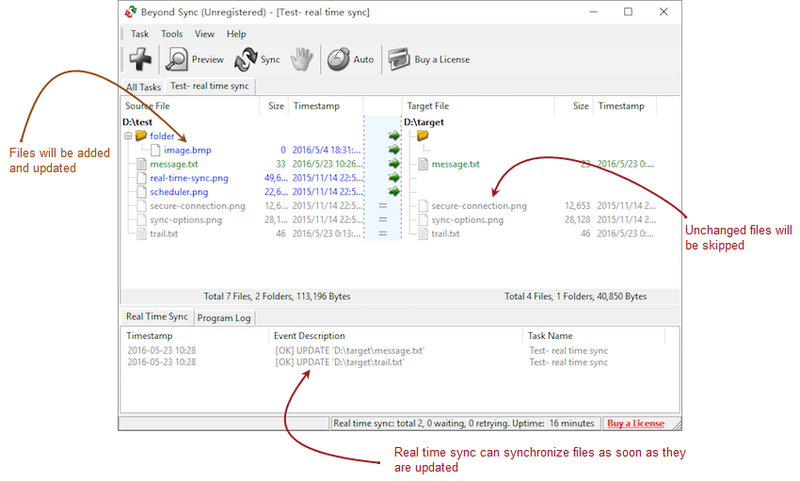 Synchronize files correctly even if the time zone between source and target is different. How about if you modified a same file in both source and target folder? Most software can NOT handle this, they simply overwrite old files. Beyond Sync takes care of this situation. You can ensure your files will not be overwritten by mistake! Notify you when something goes wrong. You can monitor the sync process anytime, anywhere. You can integrate the sync process with your current workflow. Ensure your files were synchronized 100% successfully.